Without a doubt, fall is my favorite season for food. It may seem counter intuitive, what with the delicate flavors of spring, and the glorious produce of summer… but there is no other season that has the same punch of flavor that fall does. 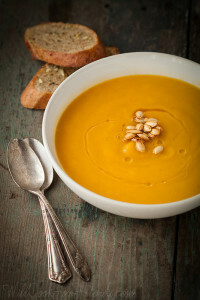 While fresh herbs are still lingering on from summer, things like squash and root vegetables are at their peak, which means big bowls of butternut squash soup with sage and plates piled high with fresh autumn salads. Not to mention all the warm spices that come with fall cooking. 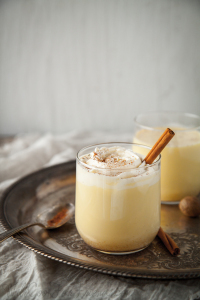 By mid October, all I can think about are cinnamon, cardamom, ginger, and nutmeg. The release of The Casual Veggie Cookbook (featuring recipes from your truly), which is officially available for download starting TODAY! I can honestly say, I wish I had a cookbook like this when I was learning to cook. In fact, even now, there’s plenty I can learn from it! To celebrate the release of the book, and all the hard work that’s gone into it, a bunch of us contributors are putting on a launch party potluck. I’m on cocktail duty, and this Sparkling Pear and Ginger number is my drink of choice. 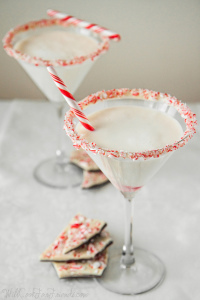 I’m going to get on with the recipe here, but don’t forget to check out all the other recipes being shared in the potluck at the end of this post, just below the recipe for this cocktail. Now, let’s talk liquor, shall we? This cocktail spawned from my love of three things: pears, ginger, and this Sage liquor from a company called Art in the Age. I have been coveting their organic, small batch spirits for over a year now, wanting all the while to share a recipe with you, but never quite finding the time. 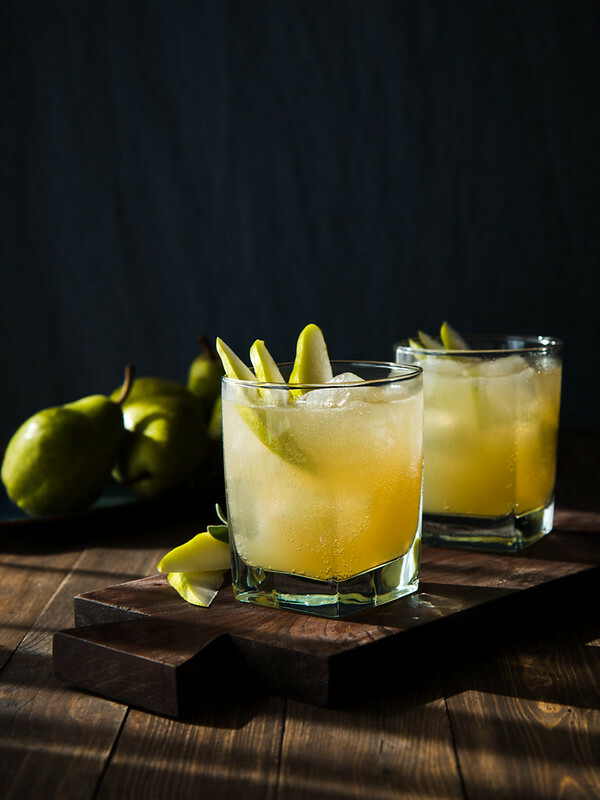 Then as I found myself playing with the idea of a pear and ginger cocktail (two of my favorite fall flavors), all I could think about was how to add just a little something special to the mix. All of the Art in the Age spirits (there are four that I’ve tried) have huge depth of flavor, which are great for sipping on their own, or mixing to create totally new, unique cocktails. This particular one has more than 15 organic ingredients, including sage, black tea, orange peel, rosemary, thyme, and fennel. The flavor is herbaceous and complex, but not overpowering, which was exactly what I wanted for this drink. If you can’t find this particular alcohol, you could probably get by steeping sage, rosemary, or other herbs in a small jar of vodka for several hours before making this drink (experiment with steep time to achieve the level of flavor that’s right for you). You can also leave out the booze all together, for a fun twist on ginger ale. If you do have the chance to get your hands on some Sage Art in the Age, though, I definitely recommend giving it a try! Sweet, herbacious, complex, and with just a touch of fizz. This cocktail makes for the perfect sipper, or can be made sans the alcohol for a fun twist on homemade ginger ale. In a small saucepan, combine the ginger, sugar, and water. Place over high heat, and bring to a boil, then reduce heat to low and simmer for 5 minutes, stirring occasionally. Remove from the heat, and let steep for anywhere from 5-15 minutes, or until the syrup is as strong as you like it -- the longer it steeps, the stronger and spicier the ginger flavor will become. Stir in the lemon juice, then strain the mixture into a jar. Let cool, then refrigerate. Syrup can be kept for up to a month. 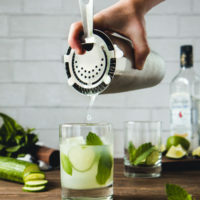 To a cocktail shaker with ice, add the pear nectar, sage liquor, ginger syrup, and lemon juice. Shake briskly, then strain over ice. Top off glasses with ginger ale, or sparkling water, to taste, and garnish with slices of fresh pear. 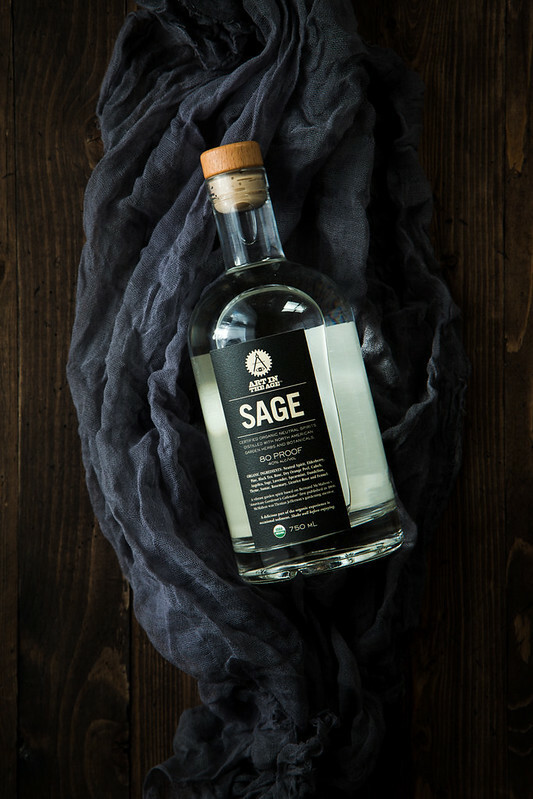 If you can't find the sage liquor, you might be able to produce something similar enough for this cocktail by steeping sage, rosemary, or other herbs in a small jar of vodka for several hours. If you can find it, however, I think it's definitely worth trying. This cocktail can also be made sans the alcohol, and is still mighty tasty! The ginger syrup is one of my favorites for mixing drinks both alcoholic and non. 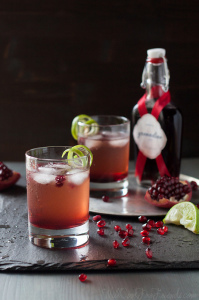 Try mixing it with this blackberry simple syrup (recipe here: https://www.willcookforfriends.com/2014/08/blackberry-soda-with-homemade-blackberry-syrup.html) gin, and lime juice, or just stir 2-3 oz into a glass of sparkling water for homemade ginger ale. 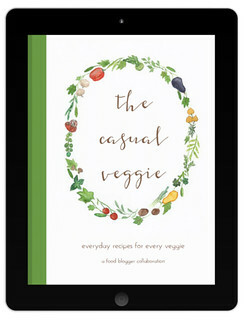 Grab your copy of The Casual Veggie Cookbook here, and check out all the other drink and appetizer recipes being shared by my fellow Casual Veggie bloggers via the links below! Cheers! Roasted Beetroot with Crisp Chickpeas, from Where is my Spoon? This page contains an affiliate link, which means when you purchase a copy of the book, a portion of the proceeds go directly to supporting this site. 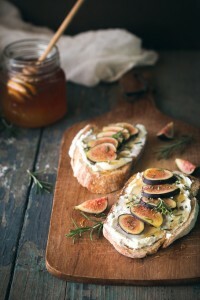 Your support literally puts food on my table and on the blog, so THANK YOU! Congratulations on the cookbook!! How exciting!! This recipe looks delicious. I am always drawn towards drinks with pear in them. Thanks, Ruth! I actually think this might be the first pear cocktail I’ve tasted. Such an underrated fruit! Thank you so much, Ellen!!! Yes, you did it right. I hope you enjoy the book! This looks amazing! And perfect for a cozy fall night in the Mitten :) Sage liquor?!?! Yum! 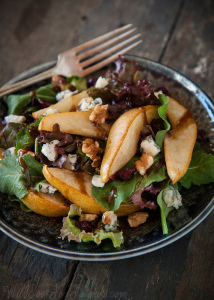 Thanks, Brie — you are so right, pears are the peaches of fall! I had never had a pear cocktail, either, but am so glad I decided to give it a try! Thanks, Kate! You’re absolutely right, this would be great for Thanksgiving! WILLOW! i am so totally proud of you for being a part of this cookbook, girl! 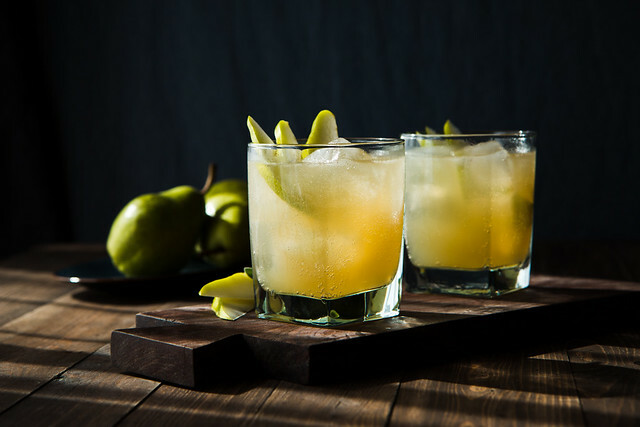 And say no more about this cocktail: i’m IN, because the whole pear/ginger/sage situation you have going is probably one of my all-time favorite flavor combos…so perfect, really anytime of year, but definitely right now and during the winter. Thanks, Annemarie, I’ll check it out! A cookbook… How exciting! 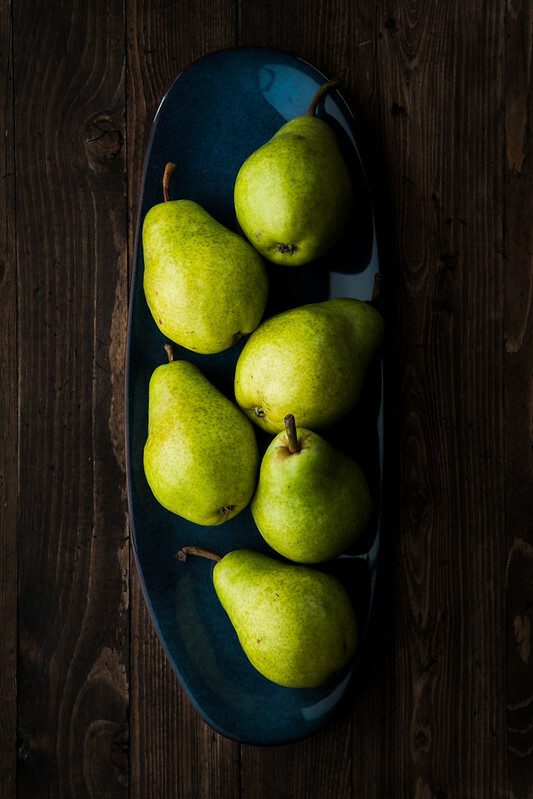 I’m all about the veg love, and I adore all things fall–especially pears. This is a gorgeous cocktail, and now I’m going on the hunt for that sage liquor.